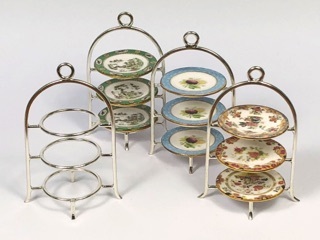 We have a small range of sterling silver cake stands and brass plate stands suitable for displaying our range of Chelsea plates and dinner plates. They are not suitable for the Sovereign plates as these are a little larger. 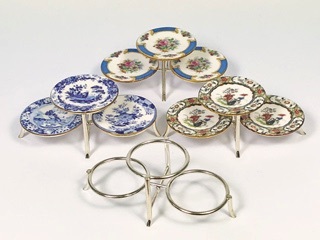 These sterling silver cake stands are hand made and are approximately 50mm high by 32mm at the widest point. They look lovely with 3 matching plates or 3 coordinating plates. 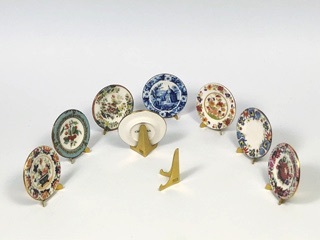 These display stands are made especially for us and are approximately 50mm long and 24mm wide at the widest points. They make a marvellous dining table centrepiece or on a side table or shelf. Individual plate stand in brass with 'SW' etched into the side. I generally attach them to the back of the plates with a bit of tack as this makes them easier to move around.